30-year old Arnesia Washington has been charged with murder after a multi-vehicle accident this weekend that claimed the life of a motorcyclist. Channel 13 reports that Washington was driving on the 610 West Loop in Houston with two young children as her passengers around noon Saturday when she rear-ended the motorcycle. At the time she was being followed by two other motorists whose vehicles she has previously struck in two separate hit-and-run accidents. Reportedly Washington also attempted to flee the scene after striking the motorcyclist but was blocked-in by the vehicles that were following her. Washington has previously been charged in Harris County with possession of a controlled substance, and is believed to have been under the influence of hydrocodone, a prescription painkiller, at the time of the fatal crash. Blood results are pending. Normally this type of accident (which is all too common in Houston) would be charged as intoxication manslaughter, but Washington has been charged with felony murder because she had the young children in her vehicle. The deceased motorcyclist has been identified as Steven Rudoff who is from Sugar Land. Mr. Rudoff leaves a wife and three children. Charles Ray Dailey, 44, has been charged with manslaughter in connection with an October 26, 2012 three-vehicle accident that killed Mark Arnold. The wreck happened at the intersection of West Montgomery Road and Wilburforce Street in Houston. In furtherance of their investigation of the accident, HPD obtained a court order to retrieve data from the air bag control module of Dailey’s pickup truck. The data showed Daily was traveling at a staggering 94 MPH (in a 35 MPH zone) two seconds before the impact. Dailey, who was traveling on West Montgomery, crashed into Mark Arnold’s truck as Arnold crossed the intersection, causing Arnold’s truck to collide with another vehicle waiting at the intersection. 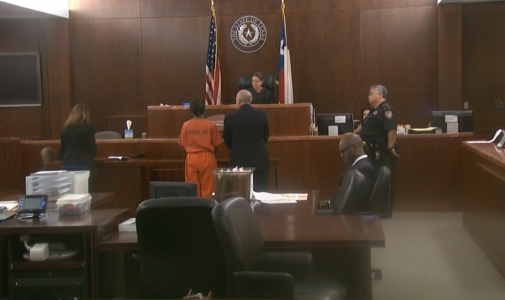 A KHOU story says that a witness said when Dailey’s truck passed her he was traveling so fast that it made her car shake. 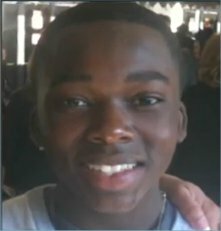 After the wreck Dailey was taken to Memorial Hermann Northwest Hospital where he consented to a blood draw, the results of which are pending. 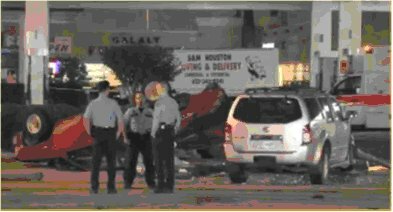 According to Baytown Police, suspected shoplifters Jennifer Rene Jenkins (35) and Shannon Joe Chauncey (43), led police on a chase Friday night that culminated in a multi-vehicle accident in which a 16-year old boy was killed. 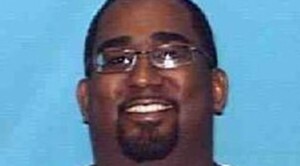 Channel 2 reports that Jenkins stole a pillow and comforter from a Sears store in the 6900 block of Garth Road, then left the store and climbed into a pickup truck driven by Chauncey. Police then found the couple stealing from a nearby Academy sports store. Once the couple were in their pickup, the police moved in to make an arrest, however Chauncey backed up the truck and struck a police car before fleeing on Garth Road. When Jenkins and Chancey reached Garth Road and Rollingbrook they struck a pickup truck and also a car, killing the car’s 16-year old passenger Shawn Williams and injuring the 17-year old driver, Shay Hollingshead. Shawn’s sister Tyler Williams told Channel 2 that she learned about the accident via Twitter: that there had been a collision near a 24-hour Fitness gym and that one of the vehicles had caught fire. Shawn was less than five minutes from home where the wreck happened and had just finished working a shift at El-Toro’s To-Go Kitchen. One of the managers at El-Toro’s, Herb Martinez, described Shawn as one of the most polite people he has ever met. After the crash Jenkins and Chauncey jumped out of their wrecked pickup truck and tried to flee the scene, but were apprehended after a short foot chase. Shay Hollingshead and transported to Memorial Hermann via life flight helicopter in serious condition. Channel 11 report. Channel 13 report. Houston Chronicle report. Two people were killed in a car accident and vehicle fire early Tuesday morning on FM 2978 about five miles outside Tomball in southwest Montgomery County. A pickup truck and flatbed truck collided near a curve in the roadway: state troopers say two people riding in the flatbed truck died. The driver of the flatbed truck, 31-year old Wilson Avelar, is in the process of being charged with two counts of negligent homicide according to DPS Trooper Erik Burse. According to Channel 11’s story, the accident happened because the flatbed truck, which was pulling a trailer, was trying to avoid a pickup truck that was waiting to make a left turn, but the flatbed’s brakes locked and the driver swerved, clipping one truck before hitting a Ford F-150 pickup head-on. 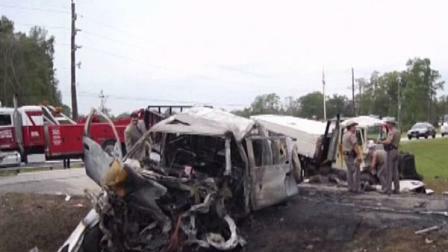 The flatbed then burst into flames, killing two inside. According to Section 6.03(d) of the Texas Penal Code, a person acts with “criminal negligence” when, with respect to circumstances surrounding his conduct or the result of his conduct, he ought to be aware of the substantial and unjustified risk that the circumstances exist or the result will occur. The risk must of such a nature and degree that the failure to perceive it constitutes a gross deviation from the standard of care that an ordinary person would exercise under all the circumstances as viewed from the actor’s standpoint. Channel 13’s story. Channel 11’s story. A 56-year old man was killed last night in a major hit-and-run accident at the intersection of Harwin Drive and Fondren Road, and police are looking for the female driver who caused the deadly crash. 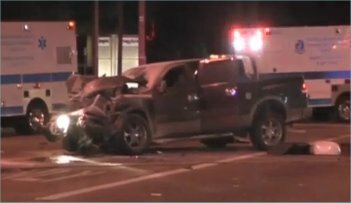 Houston police say a woman was driving a newer model silver-colored Nissan Pathfinder SUV at around 2:00am last night when she ran a red light at the intersection, t-boning a red pickup truck that was waiting to make a turn on Fondren Road. The Pathfinder was apparently speeding because the impact was sufficient to shove the red pickup truck through the intersection and flip it onto its roof. Investigators say the woman driver briefly checked on the 56-year old man who was trapped inside the pickup truck. Instead of helping the man she had just crashed into, the woman and her male passenger fled the scene on foot. Houston Police Department is confident however that they will be able to identify the woman who was driving the Pathfinder. Sergeant D. Thomas with HPD told reporters that they have fingerprints lifted from the Pathfinder and also DNA from the driver and passenger side airbags which deployed in the wreck. Emergency responders tried to save the trapped man inside the pickup truck but he had already died from his injuries. The name of the man in the pickup truck has not yet been released. 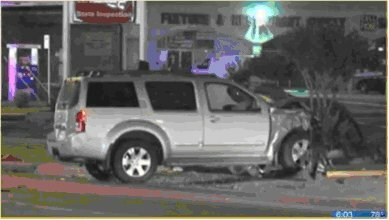 If you have information that may help police identify the driver of the Nissan Pathfinder or her passenger, please call the HPD hit and run unit at 713 247 4065 or Houston Crime Stoppers at 713 222 TIPS. 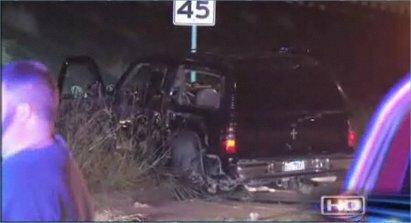 Crash investigators believe the couple in the Nissan Pathfinder fled because they had just left a nearby club and the woman was probably driving while intoxicated. The woman is described as Hispanic and between the ages of 20 and 25. This is an absolute disgrace: hopefully HPD will get the driver of the Pathfinder quickly identified and in custody. Our sympathies to the friends and family of the victim in the red pickup truck. Channel 11’s report is here. Channel 13’s report is here. FOX News’ report can be read here. Channel 2’s coverage of the hit-and-run is here. Channel 13 News is reporting a police chase last night involving a 7-year old and 3-year old child. The sequence of events began just before 9:00pm at an apartment complex on Blackhawk. According to investigators, a husband and wife were arguing so the wife went to a friend’s house to escape the situation, but she still felt threatened by the husband so she called for help. 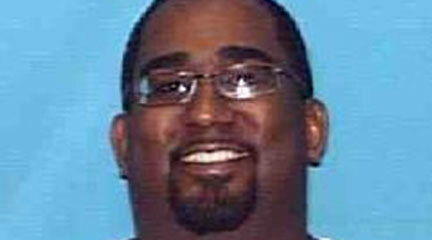 When police approached the husband in his SUV he took off with his three and seven year old children in the back seat. Instead of stopping for deputies, the man fired shots at them. This then turned into a vehicle pursuit on the Gulf Freeway: during the pursuit the man was on the phone with his wife, threatening her. After briefly evading police the man’s black Chevrolet Tahoe SUV was spotted about 20 minutes later. The man had flipped the SUV at the Gulf Freeway and Clear Lake City Boulevard. 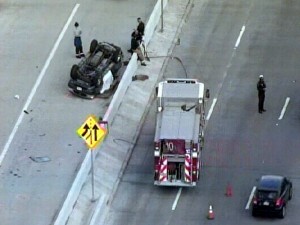 The news report indicates the children were not seriously injured in the rollover accident. Did you know…? In a single-vehicle accident where one family member is driving and another family member is injured, the injured family member can still make a claim under the insurance policy on the vehicle, however under the terms of the insurance policy, the amount the injured family member can recover is typically limited to the state required minimum liability limits for bodily injury. In the Texas the current minimum liability insurance all driver’s must carry for bodily injury or death caused to another person is $30,000. If you have been injured while riding in a family member’s vehicle and your family member was at fault, call Houston injury attorneys Smith & Hassler for an explanation of how such an insurance claim against a family member works. One of the frustrating aspects of drunk driving is that first time drunk drivers often face fines and probation but relatively soon after causing a drunk driving accident they have done everything the criminal law system required them to do and can move on with their life. Many times the people they injure continue to suffer from the effects of the accident, physically and psychologically, for many years. A Galveston judge has ordered a drunk driver who crashed into a woman’s car, seriously injuring her, to pay the woman $862,118 in restitution to cover her medical expenses. Sarah Hrachovina Coreas, age 21, was seriously hurt in the crash that happened 18-months ago, and was present in court when the drunk driver‘s punishment was decided. Omar Santana Ortiz, 31, pleaded guilty to intoxication assault for the accident. 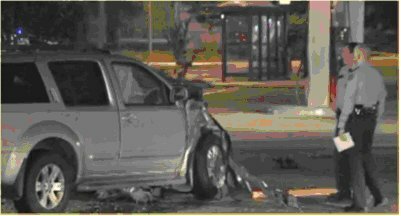 The crash happened at the Gulf Freeway frontage road and 61st Street on October 18, 2010 – Ortiz was more than twice the legal limit for intoxication. Three cars were involved in the accident. The restitution payments will be broken up into monthly payments of $7,184. Ortiz’ 10-year prison sentence was probated and he was ordered to do 10-years of community supervision. Who knows if Ortiz will ever repay anywhere near the $862,118 the judge ordered him to repay Sarah Coreas, but having the debt hang over him will hopefully serve as a reminder and go some way to deterring him from driving drunk and hurting someone else in another accident. Channel 2’s story is here. Jose Olivarez, a 32-year old undocumented immigrant from Mexico, has been charged with criminally negligent homicide in connection with a high-speed crash on the W. Sam Houston Tollway near Bellaire Boulevard yesterday. According to the Harris County Precinct 5 Constable’s office, Olivarez was driving at high speed in his SUV when he lost control of the vehicle, hit a wall, then a toll booth light, then another wall and finally an SUV in the EZ Tag lane. The SUV struck by Olivarez flipped over, killing the man driving the flipped SUV. The man’s wife who was with him in the vehicle reportedly was not physically injured. Officers placed Olivarez in custody on discovering he was uninsured and did not have a driver’s license. A female vehicle in Olivarez’ vehicle fled on foot. Our hearts go out to the poor lady who lost her husband in this avoidable tragedy. ALWAYS ensure you are driving at a safe speed for Houston’s busy roads and stop/start traffic conditions.